When the economy presented financial challenges, Nicole and Lianne sought a more affordable way to shop for their own families. 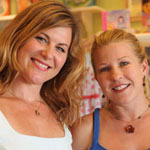 Inspired by the joy of finding a bargain and through their appreciation for recycling, Nicole and Lianne began shopping at children’s resale boutiques for their newborn. The more they shopped, the more they realized they could – and should – start their own resale store that would meet the needs of families like theirs in Santa Barbara. After Nicole took WEV’s SET course, the partners started Happy Little Hippo, a children’s resale boutique with the feel of a retail store, and the accommodating service and prices of a family-owned business.